□ The arrest and subsequent trial of Bo Xilai for corruption. Bo was a very senior Party figure (a so-called Princeling whose father was one of the Party’s “Eight Immortals”), and had been expected to join the Politburo Standing Committee at the 2012 Congress. His wife was separately convicted of murdering British businessman Neil Heywood. □ The intervention of former president Jiang Zemin in the final preparations for the leadership change. This became essential after President Hu’s top aide was involved in a scandal where he endeavoured to cover up the death of his son — who crashed while driving a Ferrari at high speed through Beijing, accompanied by a woman who also died of her injuries. No such dramas have occurred this year. And as the chart shows, there has been no need to boost the economy via a repeat of the 50 per cent increase in monthly stimulus lending seen in 2012. 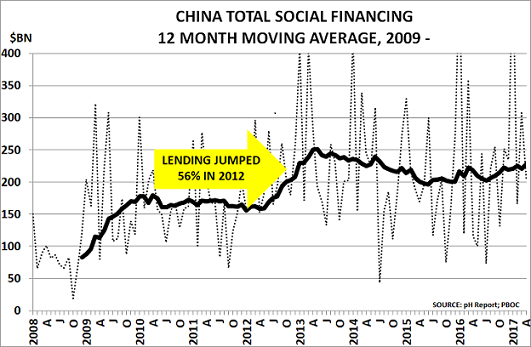 Instead, growth in total social financing has actually been slowing. Companies and investors need instead to focus on the two new areas being promoted by President Xi ahead of his nomination for a second five-year term. □ It positions China to resume its geopolitical role as the Middle Kingdom, with the One Belt creating a land link from China to Europe, while the One Road creates a maritime link between the South China Sea, the South Pacific Ocean and the Indian Ocean. 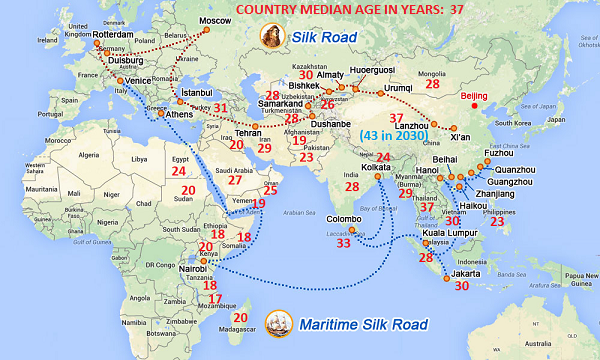 □ Economically, as the map shows, it connects China’s ageing population (its median age will be 43 years by 2030) with the much younger countries along the Belt and Road. Most of them have median ages between 17 and 30 years. The OBOR project enables China to benefit from the demographic dividend potentially available to its neighbours. OBOR is thus critically important for China as it seeks to avoid becoming old before it becomes rich. The second new policy is Xi’s decision to move away from the “growth at any price” policies of his predecessors. He knows that reducing pollution, rather than maintaining economic growth, has become key to continued Communist Party rule. As Alan Clark noted in beyondbrics, “environmental sustainability is rapidly moving up the agenda . . . (as) heavy palls of industrial smog have almost become the norm in some Chinese cities”. The recent rapid elevation of Beijing’s mayor, Cai Qi, to become party chief for the city is further confirmation of the high priority now being given to tackling air pollution and stabilising house prices. Taken together, these policies represent a paradigm shift from those put in place 40 years ago by Deng Xiaoping after Mao’s death in 1976. This shift has critically important implications, as it means growth is no longer the main priority of China’s leadership. In turn, this means that stimulus programmes of the type unleashed in 2012, and on a more limited basis by Premier Li last year, are a thing of the past.